Ah, the best of Chicago is almost here. Get ready friends, this is going to be a great spring and summer. We have some great show’s coming up for you, (see our calendar) and some recordings to release. We’ve been busy over the winter. Most significantly has been the addition of Don Kovach on bass and cello. I think you’ll like what you hear. We look forward to seeing you soon. Inside, (at Outtaspace, Fitzgeralds or Unity Temple,) outside, (at Scoville Park, Porchfest or Berwyn Brewfest,) or upside down (well, now that’s up to you). We can’t way to see you. Hiya. We are back. Excited to be sharing more music at our favorite venues in town, and of course, hoping to see you at a show. You’ll notice some changes in our lineup, so be sure to come celebrate the start of 2019 with us. We will also be in touch over the holidays (a few things are yet up our sleeves) but we are getting ready for our visit to the Friendly Tap in Berwyn on Jan 12, and then Amy’s Wine House on February 23. Victoria will be sharing some tunes at Amy’s Wine House in more sparse arrangements, singer-songwriter style on Jan 26. Put em’ on your calendar – we want to see you. Got any questions? Don’t be shy. KettlestringsMusic@gmail.com. We kicked off the warm weather (hallelujah!) by accompanying the Women Inspired by Song Ensemble on Sunday May 6 at Unity Temple in Oak Park. We got those toes tapping and our ensemble members reported having a great time singing with the band. June 20th we are performing at Navy Pier for a private party. Speaking of which, do you want us to come play your private party this summer? Give up a shout and we’ll see if we can make it happen! If you are interested, our own Victoria Storm and Richard Raskin will be playing some of Victoria’s original tunes along with a few Kettlestrings tunes at Wishbone on Chicago’s north side on June 23, along with the one and only Scott Fab, captivating singer/songwriter from Detroit. In July you can find us warming up the lovely space at Amy’s Winehouse in Forest Park on July 28. 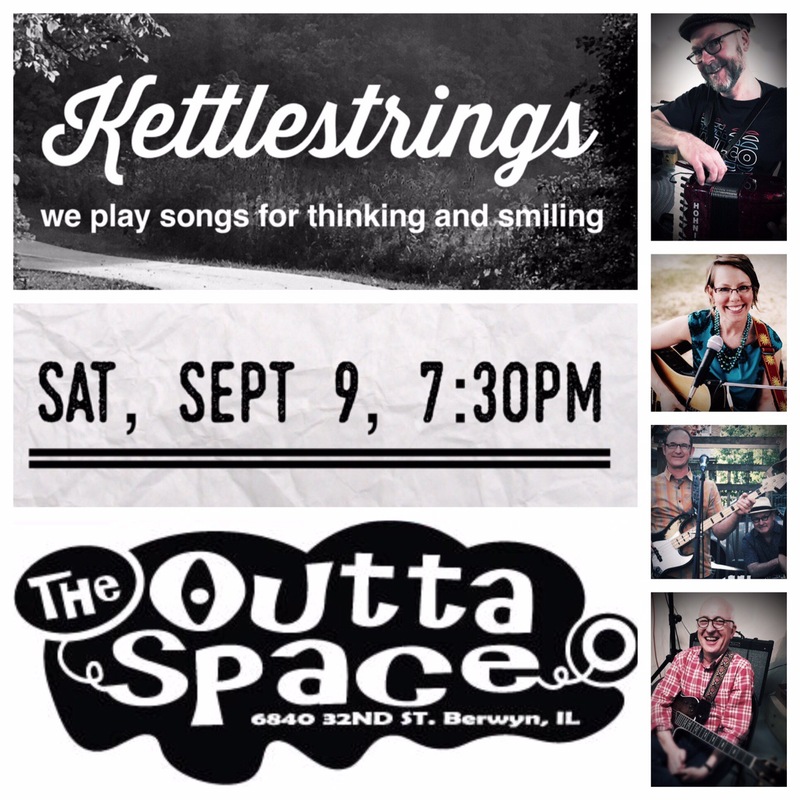 Then we will be at the Outtaspace in Berwyn on August 18, so put it on your calendars. Loads of new music to share with y’all. Oo, we can tell it already, this is going to be a GREAT summer! Looking forward to seeing you soon! Join us next weekend as we reflect and say goodbye to summer, and welcome autumn. It’s the best time of year. What are you looking forward to? Back to school? Back to work? Back to dark beer and pretzels? Two gigs in 10 hours – 2x more fun. Wow – what a whirlwind. Invited to play at Magic Tree bookstore, Ed (accordion), Steve (bass and vocals) and Victoria (vocals and guitar) shared a set of tunes unplugged. It is so much fun to explore these tunes in different formations! We love it! Later that night, Steve, Victoria, and Ray shared a set of Victoria’s original tunes at the UT Spring Music Fest where a dozen or so additional musical acts raised scholarship money for student musicians. It was a great night of sharing and variety! Here’s a few photos to share the events. If you were there, thanks for coming!! You know who you are! Looking to purchase Victoria’s solo EP? You can grab it at iTunes or CDBaby.com/cd/VictoriaStorm. Follow on your favorite streaming platform – available on AppleMusic and Spotify.